Recently I was in Leeds and took the opportunity to visit Le Keux Vintage Salon. Lilac lovely Diablo Rose (erstwhile model, stylist, ambassador for Directions hair colour and sister of the founder of the original Le Keux Birmingham branch) prepped me for a vintage photoshoot using Le Keux’s own-brand make-up and brushes, and she also had a good go at styling my hair into a visual appropriation of raspberry ripple. Here are the spectacular results! As you can see, more than a fair amount of backcombing and hairspray were used to achieve this joyous celebration of Victory rolls, during which process Diablo barely batted a perfectly made-up eyelid. Despite the fact I’m no novice and can on occasion successfully style similar rolls myself (I use the term ‘similar’ loosely! ), safe to say I was most impressed with Diablo’s results, especially as she mentioned she can style her own hair like this with the use of some skilfully placed mirrors – which I most certainly could not! 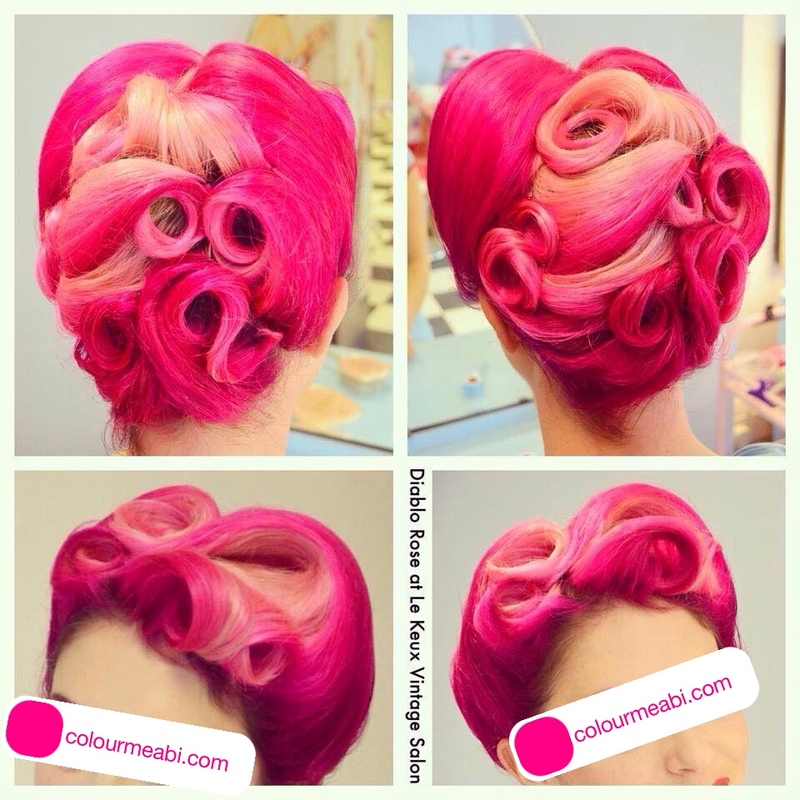 Visit the Le Keux Vintage Salon website and Facebook page for further inspiration, and watch in awe as Diable Rose imparts her Vintage hair tips on YouTube. Unmissable!